Physical weathering is a term used in science that refers to the geological process of rocks breaking apart without changing their chemical composition. Over time, movements of the Earth and environment can break apart rock formations, causing physical weathering. Physical weathering can also refer to other things in the environment breaking down, like soil and minerals. Pressure, warm temperatures, water and ice can cause physical weathering. When water in a river or stream moves quickly, it can lift up rocks from the bottom of that body of water. When the rocks drop back down they bump into other rocks, and tiny pieces of the rocks can break apart. Many rock surfaces have small crevices on them. Water can freeze in these crevices when it is cold, and then melt when the weather is warmer. This repeated freezing and thawing creates ice wedges, which can cause rocks to break. Ice wedges are a big cause of potholes in roads and streets. As ice forms in the cracks of a street, the water expands and pushes against the surrounding rock, making the cracks wider, eventually breaking apart the rock. 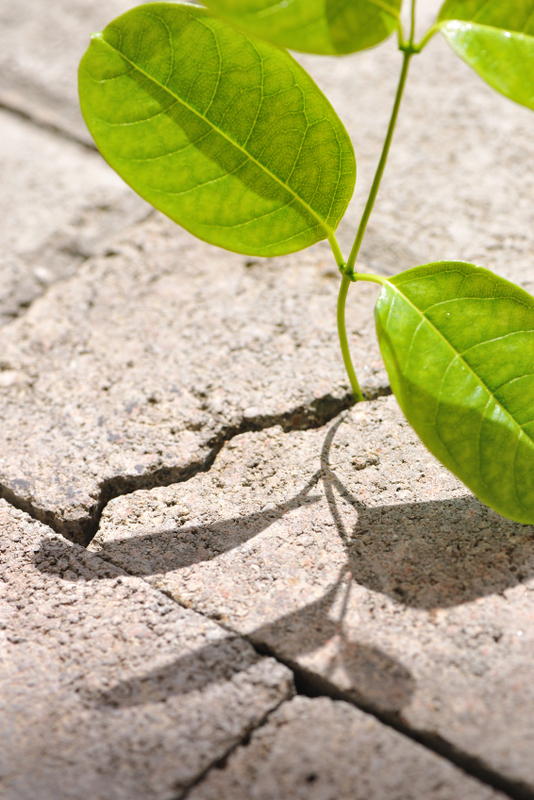 Roots of plants growing into cracks may put pressure on the surrounding rock, eventually breaking rocks apart as the roots grow. Thermal stress weathering can occur in a desert climate that is hot during the day and cold and night. The heating and cooling processes that happen every day put stress onto rocks in the outer layer, causing the outer layers of the rock to start peeling off in thin sheets. Forest and range fires can cause rocks that are located along the surface of the ground to weather. Frost shattering can result in many large loose rocks, referred to as scree, that can be found along the bottom or slopes of mountain areas. When certain types of soils freeze that are susceptible to frost, they expand due to water migrating. Ice crystals can grow in cracks of rocks. Over time this weakens the rock, and it can break apart. Block disintegration occurs when rocks split along joints. This can happen as a result of repeated cycles of freezing and thawing, which can happen in climates where there is a lot of moisture and the temperature goes up and down a lot around the freezing point. Pressure release occurs when materials on the surface are removed from erosion or another process, and the rock underneath expands and fractures. Glacier movement can cause pressure release as it moves away from a surface of rock. The rushing of powerful waves towards cracks found within rocks can trap a layer of air at the bottom of the cracks. When a wave retreats, the air that was trapped can be released with a powerful force, thus weakening the rock. When saline solutions get inside of the joints or cracks in rocks, the solution can later evaporate and leave behind salt crystals. As the crystals heat up they expand, putting pressure on the rock. Salt crystallization can also occur when solutions cause rocks such as limestone to decompose, causing salt solutions to be created, which then evaporate and leave behind salt crystals. Physical weathering caused by salt crystallization is common along coastlines. Sodium sulfate and magnesium sulfate are salts that are quite good at disintegrating rocks. Calcium chloride also disintegrates rocks, causing physical weathering. Water flowing in a stream into a rock can eventually create a hole in the rock. In each of these situations, physical weathering has occurred. "Examples of Physical Weathering." YourDictionary, n.d. Web. 18 April 2019. <https://examples.yourdictionary.com/examples-of-physical-weathering.html>.